HHT Independent Sikkim — Between Mountains and Sky! Independent Sikkim — Between Mountains and Sky! Situated on the border of Tibet and nestled between Nepal and Bhutan, Sikkim was, until recently, a small independent kingdom — the last Himalayan "Shangri-La." It offers rugged high mountain scenery and is home to the third highest mountain in the world — Kanchengjunga at 28,169 feet. It is an extraordinary place to visit because of its natural beauty and ancient Buddhist monasteries. 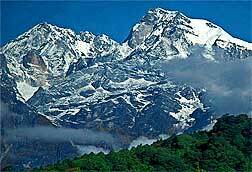 Sikkim has deep untouched forests, fabulous native rhododendrons and an abundant variety of other plant species. There is an incredible diversity to its flora (home to about 450 species of orchids alone) and fauna (famous for Bharal, also called "blue sheep" as well as an astounding variety of bird species). The people of Sikkim voted in a referendum to join India in 1975. The least populated Indian state, Sikkim is home to only half a million people. Historically it was settled by the Lepcha people from the neighboring Indian state of Assam. In the 15th and 16th centuries Tibetans also started migrating to the area, establishing a distinct kingdom. During the 19th century the British asserted control of Darjeeling. Hotels are comfortable in Sikkim and you'll find a number of "Heritage Hotels." Following independence, democratic India began land reforms. Many royal families lost their traditional means of livelihood and wealthy merchants were forced from their large estates. Many of these castles and mansions located throughout India are comfortable hotels known as Heritage Hotels. A turning point for the country was the reopening of the Nathu-La Pass between Tibet and Sikkim. Traditionally this pass was important for trade and its reopening helped revitalize the economies on both sides of the border. 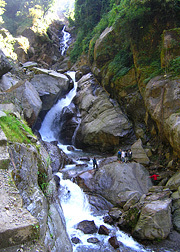 It is a pretty area where the road crosses many streams and passes near tumbling waterfalls and jagged cliffs. Another recent development is erection of the 150 foot Padmasambhava statue in Namci, in south Sikkim. Padmasambhava is the famous saint who converted all of Tibet as well as neighboring Bhutan to Buddhism. Sikkim is reached by daily flights from Delhi to Bagdogra Airport. From there, it's a five hour drive to Sikkim's capital, Gangtok. New Jalpaiguri can also be reached by overnight train from Calcutta — likely the only train you'll ever ride where you won't be given silverware! When riding the rails in remote areas, eat your meals as Indians do, with your right hand! 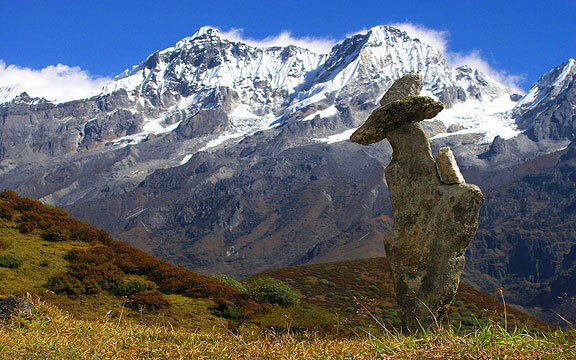 Trekking opportunities in Sikkim are mainly limited by weather and government regulations. 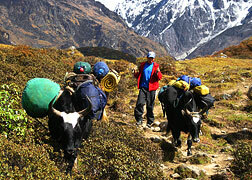 Trekking is restricted to groups of four and must be approved in advance — sometimes as much as by six months. The window of good weather is brief in Autumn — too early and you'll meet occasional monsoon outbursts which can lead to flooding, landslides and leaches... go too late and the damp climate turns frigid! 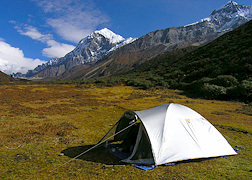 Springtime weather is warmer and the trekking opportunities last longer. While springtime views aren't quite as crystal clear as in the Fall, this liability is balanced by an astounding display of wildflowers. 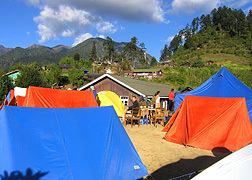 The trekking season is limited to October through November and April through May. Other times are just too cold and wet for safe travel. In addition to the traditional Dzongri and Guicha La Treks (included sections in our annual Sikkim Small–Group trips) there are other lesser–known routes such as the strenuous high altitude Green Lake Trek which requires significant planning. This 12 day trail provides you an unmatched opportunity to visit the original Kanchengjunga base camp, used before Nepal opened its borders to foreign climbers. This grueling trek takes you though lush forest before opening to spectacular high mountain vistas. A few days is sufficient to see the most of Sikkim's major historical and cultural sites. Roads are generally good and Sikkim is small! Recommended are the 200 year old Enchey Gompa in Gangtok and the Gangtok Palace. Rumtek Gompa is the largest monastery in Sikkim and seat of the Karmapa (head of the Karma Kagyupa school of Tibetan Buddhism). On the way to Darjeeling, the three hundred year old Pemayangtse Monastery is steeped in tradition and is the head of Sikkim's Nyingmapa order. Nearby Khecheopari Lake is stunning and worth a visit or a dip! Festivals in Sikkim are based on the Buddhist and Lunar calendars so the times noted here are approximate. Losar or Tibetan New Year is a significant event and a lot of fun — but February is a bitter cold time to visit! In June, Saga Dawa is the holiest of Tibetan festivals and in rainy August is a festival unique to Sikkim, Pang Lhabsol — held to worship the guardian deity of Kanchenjunga. Dancing monks portray the deity by wearing red face masks and a crown of five skulls while riding a "snow lion". Sikkim is known for its hand loom Lepcha weaving. Intricate and colorful fabrics are painstakingly made from cotton and woolen yarn. Place mats, cushion covers, shoulder bags, jackets and many unique items are crafted from this stunning woven cloth. You'll see Tibetan–styled carpets, wooden masks and Thangkas, Buddhist paintings of mandalas or Tibetan deities made on cotton which are mounted on fabric. They can be rolled up and carried like scrolls. "Time Change" by Hope Cook Namgyal, is the 1981 autobiography of a young New York debutante who marries the much older king of Sikkim. It is a story of their life together during the period when the tiny kingdom was first becoming part of the Indian democracy. "The Lion's Roar" is a documentary filmed on location in the U.S. and Sikkim with rare footage of the late 16th Gyalwa Karmapa and other well know Buddhist teachers. The Karmapa is the head of the Kagyu lineage of Tibetan Buddhism and left Tibet in 1959 to settle in Rumtek, Sikkim. 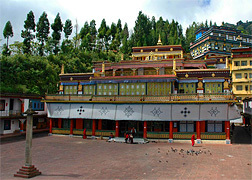 The construction of his new Rumtek Monastery was completed in 1966. In 1974, the Karmapa set out on his first world tour and completed a second tour in 1977. Later traveling in 1981, he died while in Zion, Illinois (USA), north of Chicago. He was returned to Rumtek for cremation. The film includes an interview with Chogyam Trungpa Rinpoche author of the classic "Spiritual Materialism." 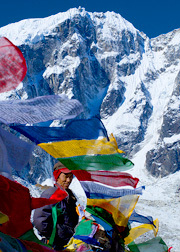 "So Close to Heaven" is an in–depth study by Barbara Crossette of vanishing Himalayan Buddhist Kingdoms. It includes a good overview of Sikkim and its history as well as environmental and political issues. Barbara is a journalist who has spent much time in the region. Custom Trips are unique by definition. It can seem to be an overwhelming prospect for you to design a Custom Sikkim trip that becomes a rewarding, once–in–a–lifetime success... and that is where we come in. Our long experience (since 1988) gives us a local familiarity with Sikkim, combined with our network of local staff that you just won't find elsewhere. Dozens of travelers explore Sikkim with us each year and you can too. There are many options to keep your trip unique, affordable, enriching and safe. Once you have the ideas for your Sikkim trip, contact us to turn them into the adventure of your life. Give us your dream and we'll give you back an adventure that you'll never forget. Our Custom Trips page reviews how you can get started.